OLDSMOBILE is a division of GM. The trademark is composed of an arrow figure and the word "OLDSMOBILE". The arrow in the head of the car represents the spirit of innovation; the letter in the rear of the car is "OLDS" and "MOBILE". OLDS is the surname of the founder. OLDSMOBILE means motor vehicle in English. OLDSMOBILE wheel rim adopts rear drive model. The former brake and the rear brake are all ventilation set type. This wheel rim is made of steel. At the same time, it is equipped with full size spare tire. Wuxi Hengsheng Wheel Co., Ltd is a professional OLDSMOBILE steel wheel rim manufacturer and supplier in China. In addition to OLDSMOBILE steel wheel rim, we also provide other famous models steel wheels (rims) for our clients around the world, like PONTIAC wheel, SAAB wheel, Saturn wheel, Scion wheels, Subaru wheel, Suzuki wheel, Toyota wheel, Mini wheels (Mini rims), Volvo wheel, etc. 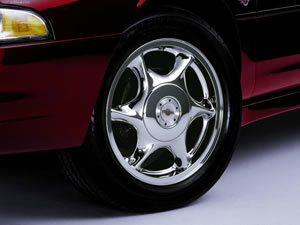 We possess a professional technology team to guarantee the manufacturing of OLDSMOBILE wheel rim. We will checkout all the products and give out a survey report. According to the needs of every client, there will be a dynamic balance sample survey among parts of the qualified OLDSMOBILE wheel rim.